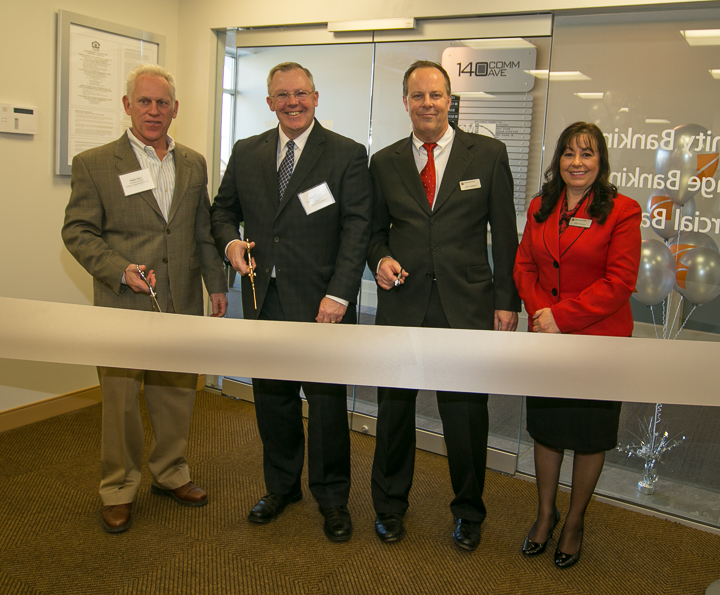 Danvers, MA – An official ribbon cutting ceremony was held to mark the opening of MountainOne Bank’s newest office in Danvers, according to an announcement by Robert Fraser, MountainOne Bank President and CEO. The new bank branch is located at 140 Commonwealth Ave, across from the Liberty Tree Mall. It is situated on the ground floor of the office building, which is often referred to locally as the “medical building.” Robert Burr, building owner and President of 140 Comm Ave, LLC, has recently completed an extensive renovation to the exterior and interior of the entire building, including the space occupied by the bank. Companies participating in the selection, design and renovation of the bank space were commercial real estate advisors Norlund Associates, architects DRL Associates, and Groom Construction. The bank office includes a spacious high-tech customer service and teller area, 5 glass-enclosed lending offices, a conference room, and a segregated office space for mortgage lenders. 24-hour ATM and Night Drop services are also available. The customer waiting area will double as a Community Corner – a space provided to local community organizations to display their upcoming events, share information with the public, and spread the good news about what they do. Nellie Homen has been appointed Community Banking Officer for the Danvers location, and has strong ties to the North Shore market area. John Hubbard, also a North Shore native, leads the large onsite Mortgage Lending team. The ribbon-cutting ceremony for the new office included the presentation of awards, as well as significant donations to local community organizations. A MountainOne Vendor Excellence Award was presented to New England Money Handling Systems, for outstanding support of MountainOne’s branch automation projects in 2014. A MountainOne Core Commitment Award was presented to Danvers employee Stephanie Johnson, in recognition of her outstanding service and support during the opening process of the new branch. A total of $10,000 was awarded to local community organizations, including Haven From Hunger, North Shore Community Action Programs, North Shore Community Development Coalition, Northeast ARC, and the Danvers High School Marching Band, which will use the funds to support their trip to play at the 75th anniversary ceremonies in remembrance of Pearl Harbor. A special Grand Opening Week will take place from Monday, January 26, through Friday, January 30. The week will include very attractive deposit product specials, daily prize drawings for $100 gift certificates to local Danvers businesses, and free promotional items for visitors. Gift certificates will be awarded daily. The public is invited to stop by the new office, open an account, and get to know the MountainOne Bank team.